Find out how to deploy smart wireless power at scale and maximise engagement with customers through behavioural insights. Chargifi delivers a market-leading cloud management platform which takes care of the mass deployment of smart wireless charging. Our patented solution turns wireless power into a service, providing a unique touch point to engage with customers and enhance their experience. This is delivered through a cloud connected solution, called Chargifi Manage, which continuously monitors and manages deployed Chargifi SmartSpots with diagnostic scanning and over the air updates, reducing costs on service and maintenance. This ensures your service has maximum uptime for peace of mind and a great customer experience. Chargifi Connect uses Chargifi SmartSpots as a customer touch point, allowing the blending of data from existing software and apps to boost user experience. Chargifi SmartSpots are smart, connected, commercial grade 15W wireless charging transmitters that can be retrofitted into existing furnishings or seamlessly designed into new-build projects, with a range of customized options available. Commercial grade durability, liquid, and dust-resistance help preserve functionality and appearance, while semi-permanent mounting deters movement and theft. Deploying at scale is easy with our state-of-the-art installer app, enabling our partners to deploy quickly and efficiently. Real-time network and diagnostic data is available in the app at a glance, whatever the time of day. Chargifi Manage is a state-of-the-art IoT management platform that gives you full control of your wireless charging network and is at the heart of the Wireless Charging as a Service provided by our expert partners. Chargifi Manage continually scans the real-time status of your charging network, including individual SmartSpot details and attributes, such as operating temperature, connectivity, and power delivered. 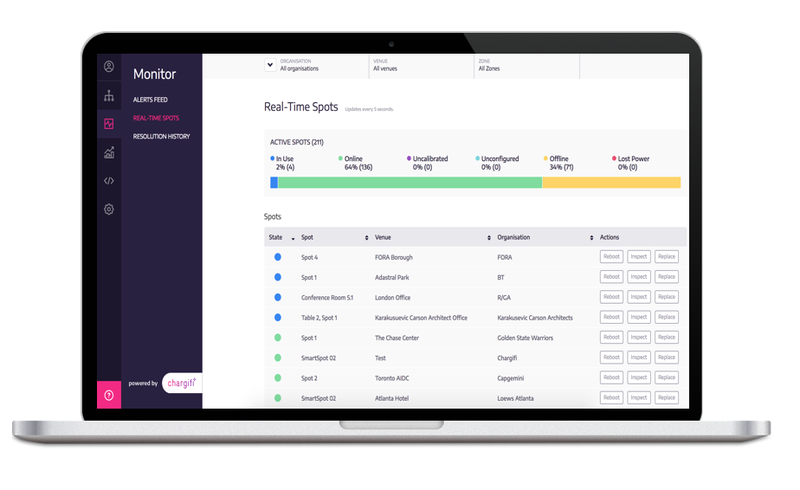 Real-time alerts inform on diagnostics detected, with many issues resolved over-the-air using remote tools for debugging, diagnostics management, and predictive maintenance. Chargifi Manage aids in reducing operational and maintenance costs and gives you the peace of mind that your SmartSpot network just works. Chargifi Connect enables businesses to blend behavioral data, such as hyper-location and dwell time, with existing apps and software. Chargifi has an open API, which also includes an SDK and webhooks, facilitating limitless possibilities for integration. Blending customer data from different systems for greater insights. SmartSpots to act as a trigger for other integrated IoT services, such as Teem office software, Zoom Video Conferencing, and collaboration software.